Every Friday we sift through all the Newegg deals and find the best few. We'll keep this page updated often, so bookmark this URL to make sure you get the latest scoop on price cuts. How's your rump feeling? Is it sore? Don't worry, we're not being inappropriate with our line of questioning, we're just getting you to think about your gaming chair. If it's lacking in posterior comfort, it may be time for a new one. There are oodles of office chairs out there, but if you're looking for something a little different, check out today's top deal for a DXRacer Formula Series Gaming Chair for $254 with free shipping (normally $289). 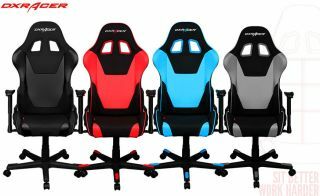 Used by several esports teams, the DXRacer Forumula Series sports a high backrest with an integrated headrest with lumbar cushion and headrest pillow included. It has adjustable arms and height (gas-spring), and can even lay all the way back for a power nap! While on the topic of gaming, Newegg tells us it will have a limited supply of Nvidia's GeForce GTX 1070 graphics card today. You can check for inventory here.